When VLK Architects was hired to design iProspect’s new office in Fort Worth, they sought to intertwine the city’s historical elements with a high-tech industry. The use of wood, metal, railroad ties & historic glazing reflects materials found in Fort Worth stockyards. The rehabilitated, one-story warehouse features an open layout, so employees can focus on collaborative team building. The design team used sustainable strategies such as salvaging existing walls for partitions and using reclaimed wood for the sliding barn doors. 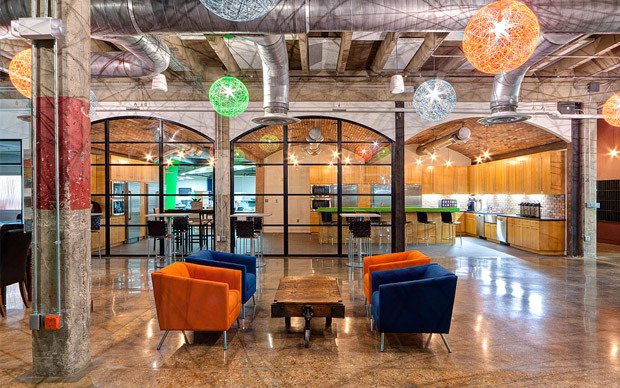 When VLK Architects was hired to design iProspect’s new office in Fort Worth, they sought to intertwine the city's historical elements with a high-tech industry. The use of wood, metal, railroad ties & historic glazing reflects materials found in Fort Worth stockyards. The rehabilitated, one-story warehouse features an open layout, so employees can focus on collaborative team building. The design team used sustainable strategies such as salvaging existing walls for partitions and using reclaimed wood for the sliding barn doors.